In the video below Dr.Timohty Howe, MD, a specialist in Internal Medicines and Coronary Artery Disease (CAD), discusses all the important details of Metabolic Syndrome. It is worth watching this short video interview of Sheryl MacWilliams with Dr.Timohty as this video will give you a comprehensive understanding of Syndrome X. It is hardly about three decades since this specific health condition came into the knowledge of medical fraternity. Luckily, now we have a lot of right information on this dangerous health condition. According to one of the recent reports released by the American Heart Association, about 47 million Americans already are suffering from metabolic syndrome. It is heartening to know that one out of every five Americans is a victim of this poor health condition. The vast majority of the people are still unaware of this dangerous health condition that we should be very…very cautious about. After all….prevention is better than cure. A section of physicians and medical experts still refuse to acknowledge Syndrome X as a distinct health condition as it is not a disease by itself. But when you learn more about this….you will know it is a serious health issue that needs tremendous attention from everyone. 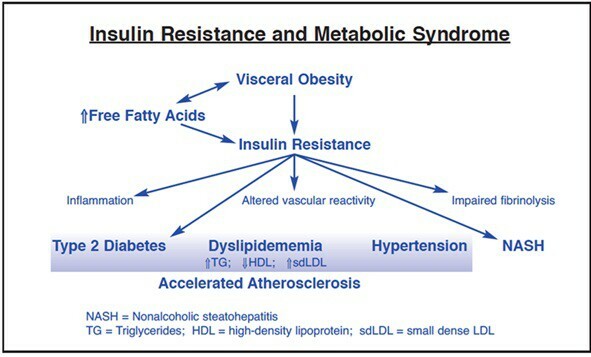 The single most important characteristic of metabolic syndrome is insulin resistance. This is a bad health condition in which the cells of the body become resistant to the insulin hormone. Body cells resistance to insulin is a pervasive health condition (also called Syndrome X), and most of the people do not realize that they have this problem until they have already acquired Type-II diabetes or cholesterol-related diseases. Insulin is a major hormone that helps the body to carry out important metabolic activities. When the insulin metabolism does not function well, other minor hormones like estrogen, progesterone, and testosterone also will gradually fail to function. There are five major symptoms that indicate whether you have metabolic syndrome. Usually, if you have any three of these five symptoms, it is a sure sign that syndrome X health condition has affected your health. A Large Waistline:- This is a case of abdominal obesity or visceral fat …an apple shaped bulging belly. Normally, if the waistline circumference in more than 35” for woman and 40” for men, it is considered as oversized waistline. A Low HDL Cholesterol Level:- The good cholesterol (HDL) level in the blood is very low, and the bad cholesterol (LDL) is more; this is a bad health condition which will give rise to heart diseases. High Blood Pressure:- When the heart pumps the blood, a certain amount of pressure is created, and this makes the blood pushing against the walls of the arteries. Balanced amount of pressure is needed for the smooth flow of blood. But if the pressure remains very high most of the time, it will damage the artery walls by building up plaques on them. It should normally be less than 120/80 mm Hg (less than 120 systolic AND less than 80 diastolic). Metabolic syndrome is still a baffling health issue to most health experts as there are no clear reasons why this syndrome develops. In fact, it is a health condition that involves many health risks factors. Several reasons are responsible for this, and the reasons also vary from person to person. As we have discussed above, one of the most significant reasons for syndrome X is a health condition in which the body cells become less responsive to the insulin hormone and also the blockage of leptin hormone signals to the brain. Visceral fat is a sign of declining metabolic rate, and it is composed of several adipose depots including mesenteric, epididymal white adipose tissue (EWAT) and perirenal fats which are bad for health. Another major reason that is responsible for Syndrome X is unhealthy diet habits that consist of a high amount of carbohydrate and fats. 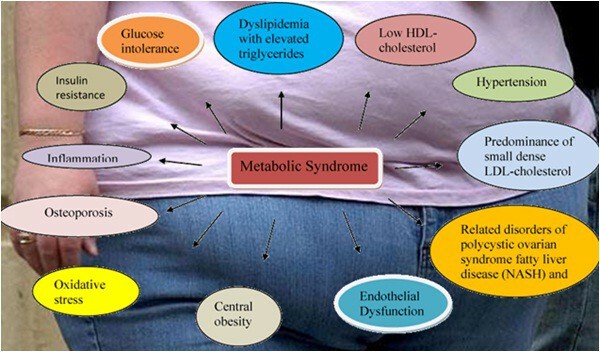 The metabolic syndrome, especially in woman, occurs because of the changes or imbalances in hormones. Many of the women develop metabolic syndrome during the post-menopause period. If you are just diagnosed with metabolic syndrome, there is nothing to be alarmed….it is a warning that immediately you need to change your diet and lifestyle habits to a healthy one. Advanced stages of Syndrome X is a very dangerous health condition that can lead you to fatal diseases. Most of the deaths in the world today are because of Type-II diabetes, heart ailments, and cancer that are caused by metabolic syndrome. Diabetes and cardiovascular diseases always follow syndrome X condition. Type-II diabetes itself gives rise to several other diseases and health issues. Diabetes affects many major organs, including your heart, blood vessels, nerves, eyes, and kidneys. Syndrome X becomes severe with tobacco exposure, lack of physical exercises, unhealthy diets, and harmful use of alcohol. These will increase the health risks by manifold. A person gradually becomes mentally and physically inactive as syndrome X becomes chronic. They are also very likely to develop diseases associated with liver and kidney due to weak metabolism and high-level blood sugar. How To Get Rid Of Metabolic Syndrome? It is easy to get rid of metabolic syndrome by making suitable changes in your erratic lifestyle habits. If you are diagnosed with Syndrome X, you should immediately be paying maximum attention to adopting healthy diet habits, quit smoking and alcoholic drinks, losing weight, regular physical exercises and making sure to have 7 hours of regular sleep. There are also corrective medicines that you can start taking under the guidance of an expert physician. The medicines are required for bringing down the high blood pressure, high triglycerides, increase the HDL cholesterol and to balance the blood sugar level. Medicines like aspirin are found to be good for reducing blood clotting that usually occurs in patients with syndrome X. Medicine like statins, fibrates, or nicotinic acid is good for reducing the LDL cholesterol level in the blood. Medicines such as diuretics or ACE inhibitors are used for normalizing the blood pressure. High blood sugar can be reduced with insulin injections or metformin pill to be taken orally. Heart diseases are more fatal than all other diseases associated with insulin resistance…and thus, priority treatment should be aimed at reducing the LDL cholesterol level and high blood pressure. Extreme care should be taken to control Type-II diabetes as this disease can gradually lead to the failure of several vital organs in the body, including liver and kidney. First of all, remove all the high-risk factors associated with metabolic syndrome and then gradually get rid of the syndrome itself. As regards the weight loss, it is important to contain your body weight in the range of 18.5 to 24.9 Body Mass Index (BMI). The metabolic syndrome sets in usually when your BMI is more than 25. There is a commonly noticed tendency among most of the Americans that they tend to become physically less active as they grow older. One of the major reasons for the development and deterioration of metabolic syndrome is the lack of active physical exercises that will burn off the excess fat and sugar storage in the body. An hour of running and jogging are good cardiovascular exercises, but you need to do regularly a few heavy exercises like push-ups and weight training to get rid of the visceral fat accumulation. A good physical trainer can guide you through the right kind of exercises and diet to be followed to reduce the body weight, especially the abdominal fat. It is always good to maintain a moderate level of physical exercises than doing those which require vigorous intensity, especially if you have crossed the prime of age and on diet restriction. Several studies in the past have pointed out smoking as the Number 1 enemy of heart diseases and for aggravating syndrome X’ health risks. Say NO to smoking…it not only destroys your metabolic system but also damages your liver and affects the healthy functioning of the brain as well. If you do not possess the mental strength and decisive determination to quit smoking habit addiction, you should take the help of smokers’ support groups and rehabilitation programs that would positively help you. A healthy diet is the best care you can adopt to get rid of metabolic syndrome. Your diet should mostly consist of a variety of vegetables and fruits. The thumb rule for a healthy weight loss diet is to have a good mixture of vegetables and fruits as 60% of what you eat at every meal. The rest 40% of your meal should consist of whole grains, healthy fats, and proteins. The carbohydrate intake must be as minimal as possible (less than 1000 calories per day). Lean meat, fish, and egg in moderation are very good and must be included in your daily diet. If you have high blood pressure, it is good to consume a very little amount of table salt which contains sodium. Too much of salts skyrockets the blood pressure very quickly. Strictly say NO to soft drinks, sodas, and all processed foods with added sugar and high-calorie ingredients. Consuming the whole fruits rather than the fruit juices is good. Drink 8 to 10 glasses of water….a glass of water every two hours. Foods prepared with refined grains and refined oils are bad for everyone’s health. People who suffer from metabolic syndrome should consume as less solid fat and Trans-fatty acids as possible because they already have weak metabolic health. Alcohol raises blood pressure and triglyceride levels, and it adds extra calories; all of these is bad for patients suffering from syndrome x condition. Losing the extra pounds is key to neutralizing the health disorders caused by metabolic syndrome. The good way to reduce body weight is to restrict the daily calories intake to as much as the body really needs and also engage in physical exercises that will help you to burn the extra calories that are stored in the fat cells of your body. Some studies suggest that the Mediterranean diet is more suitable for people who suffer from metabolic syndrome. The Mediterranean diet primarily consists of plant-based foods, such as fruits and vegetables, whole grains, legumes and nuts with healthy fats and proteins. The metabolic syndrome is not a disease but a combination of bad health conditions that trigger Type-II diabetes and cardiovascular diseases. The major factor that goes into the Syndrome X health condition is morbid obesity, high blood sugar, high blood pressure and rise in LDL cholesterol in the blood. Metabolic syndrome is caused by an unhealthy lifestyle and diet habits followed by a person for a long period. Insulin resistance or the syndrome X health condition is curable by adopting healthy lifestyles, diets, and proper medications. ‘Increased blood pressure, high blood sugar, excess body fat around the waist, and abnormal cholesterol or triglyceride levels are visible signs of metabolic syndrome.’ I have all of these. Obviously, I have already a full-grown metabolic syndrome, right? The term “metabolic” refers to the biochemical processes involved in the body’s normal functioning. Most of the processed foods, especially those with high sugar and fat, and sedentary lifestyle of the people interfere with healthy metabolic activities of the body resulting in serious diseases like diabetes, various heart related diseases, rising blood pressure, etc. Immediate change in food habits and lifestyle is the right way to overcome diseases associated with erratic metabolism. I like this article a lot. Many of us do not have any clues on why the diseases like diabetes, heart attack and stroke do really happen. The metabolic risk factors are the prime reason for most of the disease that haunts us today. The risk of having metabolic syndrome is closely linked to overweight and obesity and a lack of physical activity. This article is an eye-opener for all to be realistic about maladies that affects all today. Kudos. Good work. Great presentation by Dr.Timohty Howe. The points he dwells upon are realistic problems that are responsible for most of the health issues face by people today.